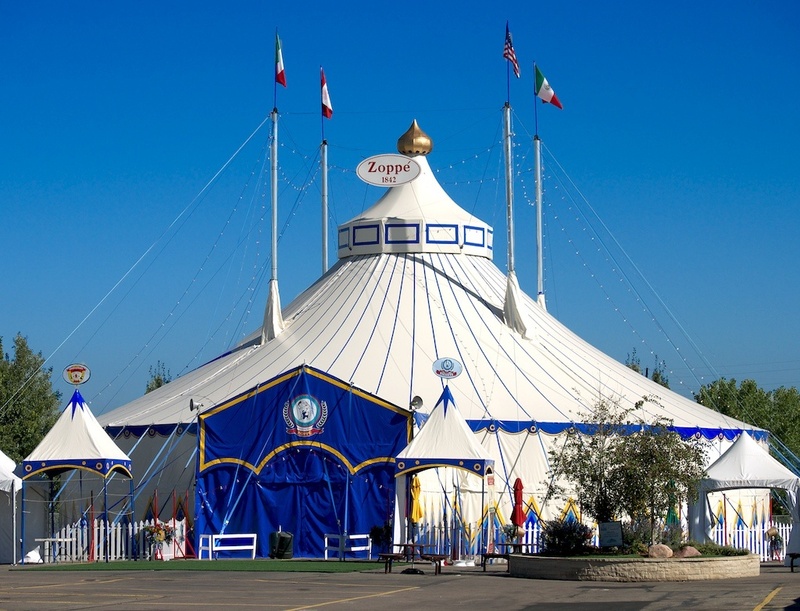 The Zoppè Family Circus welcomes guests into the intimate 500 seat tent for a one-ring circus that honors the best history of the Old-World Italian tradition. Starring Nino the clown, the circus is propelled by a central story (as opposed to individual acts) that feature acrobatic feats, equestrian showmanship, cainine capers, clowning and plenty of audience participation. Giovanni Zoppè, the sixth-generation circus performer who plays Nino, says the show aims higher than what passes for circuses these days. "We try to touch every emotion during the show," he says. "They'll laugh, they'll cry, and they'll feel for the characters. It's more of an event than a show." In 1842, a young French street performer named Napoline Zoppè wandered into a plaza in Budapest, Hungary, looking for work. There, his eyes glanced upon a beautiful equestrian ballerina named Ermenegilda, who captured the hearts and minds of the crowd with her grace and showmanship. More important, this talented beauty captured Napoline's heart. However, since Napoline was a clown, Ermenegilda's father saw him as beneath her and disapproved of their relationship. The two ran away to Venice, Italy, and founded the circus that still bears their name. Over the generations, the circus survived wars and political upheaval in Italy and the rest of Europe. Alberto Zoppè, Napoline's great-grandson, inherited the circus almost 100 years later. A grand equestrian in his own right, Alberto toured Europe with the circus since his youth, forging many unique friendships along the way, including one with famed actor/director Orson Welles. Welles, who was working in Rome at the time, persuaded Alberto to take a role in a small film about the circus being shot in London. Alberto was then offered a job by John Ringling North of Ringling Brothers fame, who was putting together the circus acts for Cecil B. Demille's Oscar-winning film, The Greatest Show on Earth. Alberto was hesitant to leave his family circus in Italy for America, but North was persistent and offered to loan the family circus an elephant for the show as long as Alberto worked for him. He obliged and was prominently featured in the film. Alberto would remain in America, producing circuses for Ringling and starting his own family. Together with his wife Sandra, Alberto has ushered in a new generation to continue the family tradition. Their children, Giovanni, Tosca and Carla, along with their spouses, have all been active at one time or another in the family business. Giovanni revived the Zoppè Family Circus in America three years ago, and has since been building its reputation with audiences and critics as an enchanting exhibition of traditional European circus. Giovanni credits his family with helping to maintain the grand traditions. He is especially grateful to his father, who at 82 years old, still manages to wow the crowd every time he steps into the ring. "He's the star of the show," Giovanni says. "He's the one that will capture you. He's just an amazing performer. I'm very proud to see him in the ring and performing." For his part, Alberto believes it's the audience that keeps circus performers like him young and in the ring. "When you see that somebody loves what you're doing, you enjoy it even more," Alberto says. "I was born into show business, so I don't think I'm going to get out of it before I die. I'm 82 now, and I've got an artificial hip and an artificial knee, but I still don't want to get out." Come experience the history of Zoppé - An Italian Family Circus!